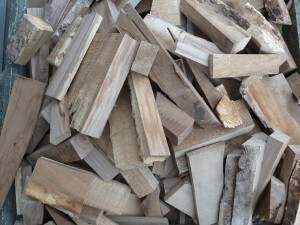 No matter how much English walnut I buy, it’s never quite enough. It’s the most wonderful stuff to work with and look at, but I’ve just spent two days solid cursing and swearing at it – I always do, then somehow forget it minutes later. This time we are building a whole kitchen in it, with the cabinet interiors being made out of solid sycamore – a big project heading for the outskirts of Bath. It seemed like a good idea at the time but today I’m wondering what I was thinking! All the doors and drawer fronts are now made and many of the cabinets are taking shape. We made these out of the 1 inch walnut we bought and had cut ourselves 2 years ago. But it’s the 2 inch that’s making me sweat, I’m down to my last 3 boards of the rippled log and I think I’ll just about get what I need. Short of inch-and-half though and we still have a free standing unit to make yet – I may be on the road again by the end of the week looking for more. 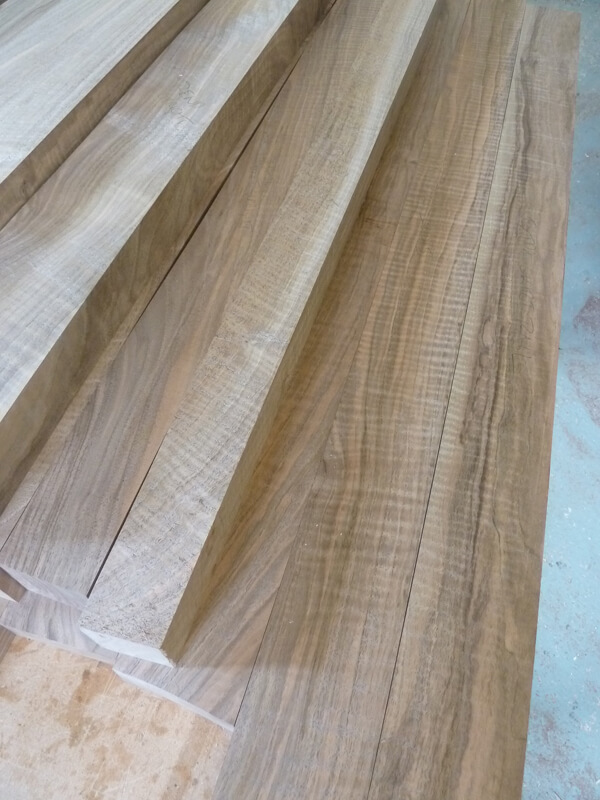 So this is the visual equasion: Lots of lovely boards of English walnut / a much smaller number of finished components = a very large deep box of expensive firewood! This equation varies a bit, but not often in my favour. 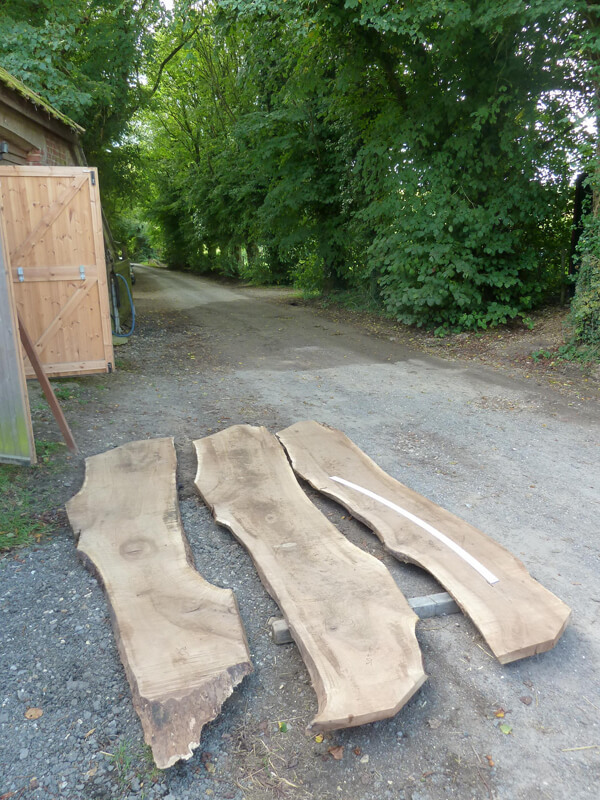 For those of you unfamiliar with the frustration of English walnut, well where do I start! • They are very individual trees with distinctive character, colour and grain – matching two logs can be difficult. 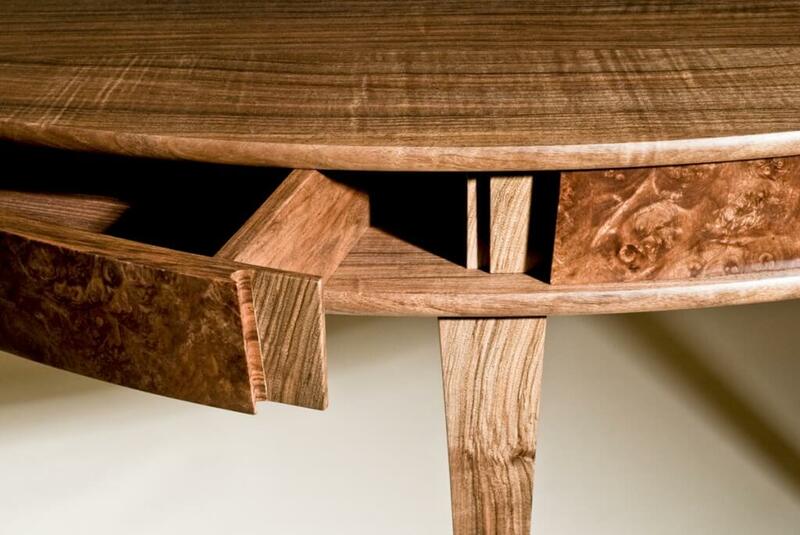 • You can’t really use the sap as the colour is very different and often really ugly – in contrast to the stunning heartwood. • The sap can be really wide, so you end up throwing half away before you have even really started. • What’s left can have shakes, rot or knots – usually just where you don’t want it to be. • Just for good measure the woodworm love it – it’s got 3 Michelin stars from their perspective. • It’s not grown commercially so you only ever find the ‘odd’ tree from an estate or garden. • I still love it, but it will make me grey and old as I load up the firewood bin with expensive off-cuts. We made a pair of pivot drawer console tables for the same clients we are making this kitchen for, like me, they understand English walnuts rare and subtle beauty. I better get back to work, cover you ears!